To proceed installation, first make sure you have created your personnal account on our site www.stormize.com. The creation of your user account as the installation of the Stormize application are very simple. We will guide you through these short steps that will take little more than 5 to 10 minutes, at most. No file or code manipulation will be required. 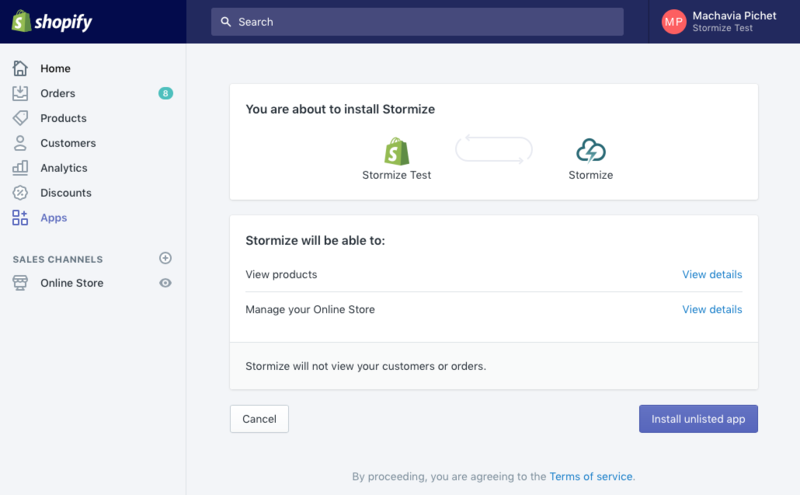 To initiate the installation of our tool, go to the Stormize page on the Shopify app store. Click on the "get" button to start the installation. At this point, Shopify will inform you of the current operation and the actions you authorize Stormize to operate. Accept the installation by clicking on the "install app" button. This one is in the general preference of your Stormize account. Here is the procedure to recover it. This unique identifier allows the validation and activation of your personal account. Once your Stormize customer ID is in hand, fill in the field provided and validate. The installation of Stormize on your shop is effective. The data collect from your E-commerce site will begin without further action. In the next few hours you will see the first stats in Stormize !.